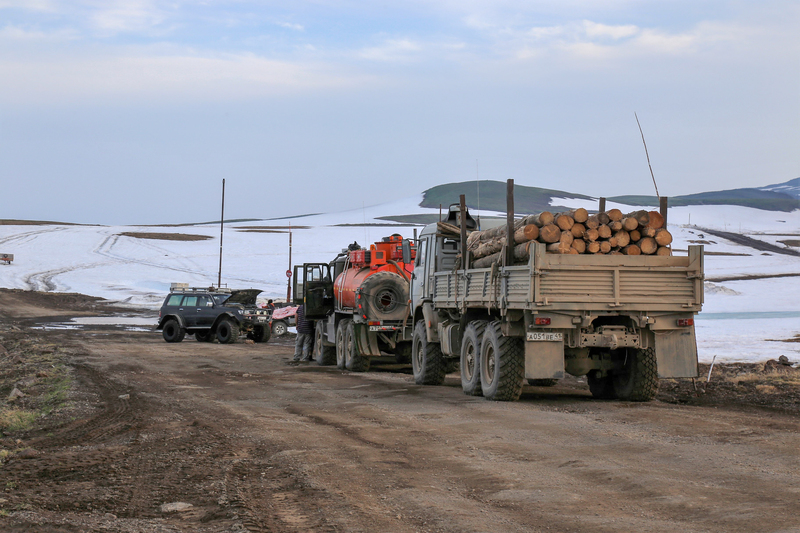 The Vilyuchinsk volcano south of Petropavlovsk Kamchatsky seen from one of the main roads south which is a transport corridor for trucks carrying logged trees, gas, and other supplies. 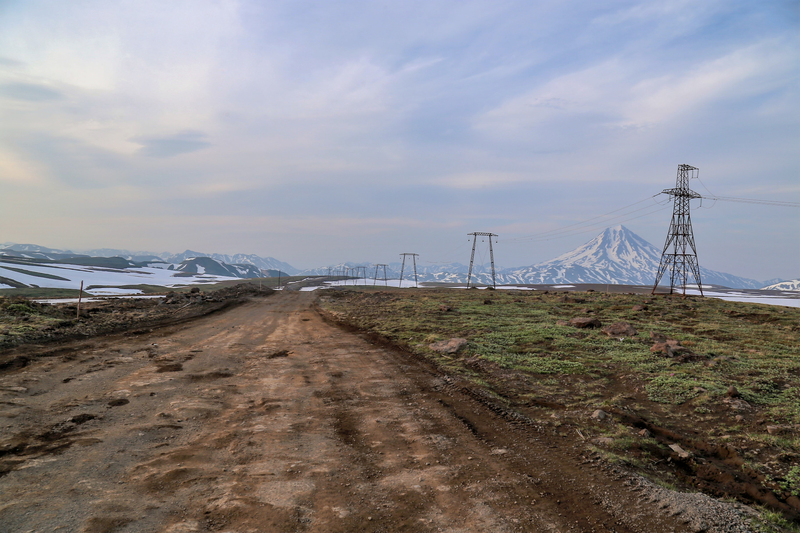 The unpaved and treacherous road south of Petropavlovsk Kamchatsky serves as a transport corridor for trucks. New infrastructure is being built to further develop the southern region. 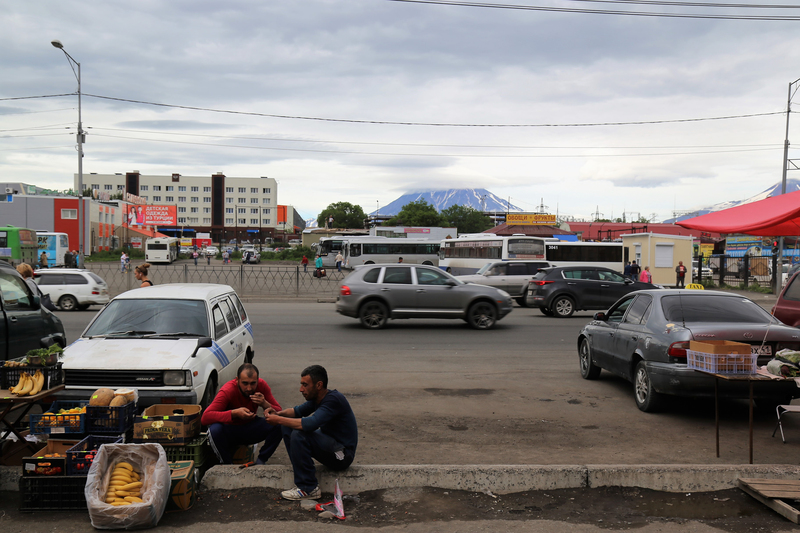 Central Asians selling fruits and vegetables along one of the main avenues of Petropavlovsk Kamchatsky with the Avachinsky volcano in the backdrop. Ali, from Tashkent lives in Milkovo, a small city in central Kamchatka. He worked in Yakutia for ten years before coming here. 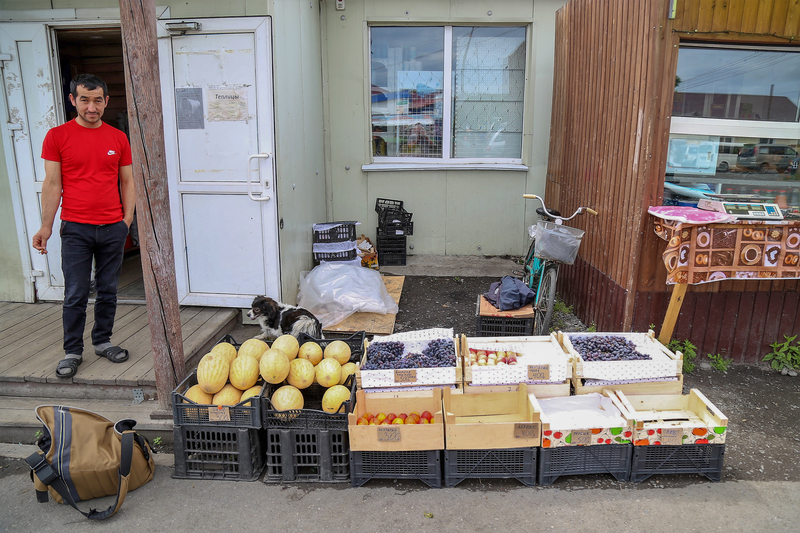 He says he is able to earn 60,000 rubles a month selling melons, grapes, and apricots from Central Asia brought by plane. He spends 6 months here and 6 months in Central Asia. He initially came to attain a Russian passport quickly under a government initiative but that failed to materialize, so he joined the fishing crews off of the Kamchatka Peninsula. 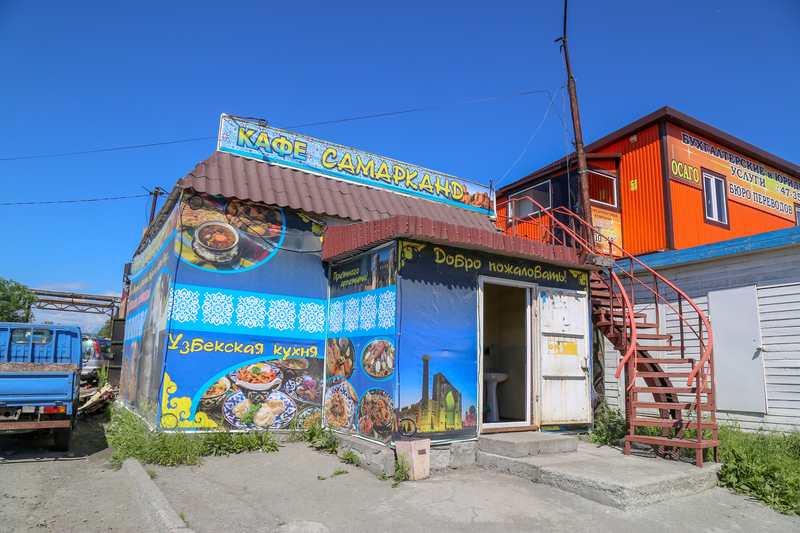 Cafe Samarkand is one of the numerous Central Asian restaurants across Kamchatka. 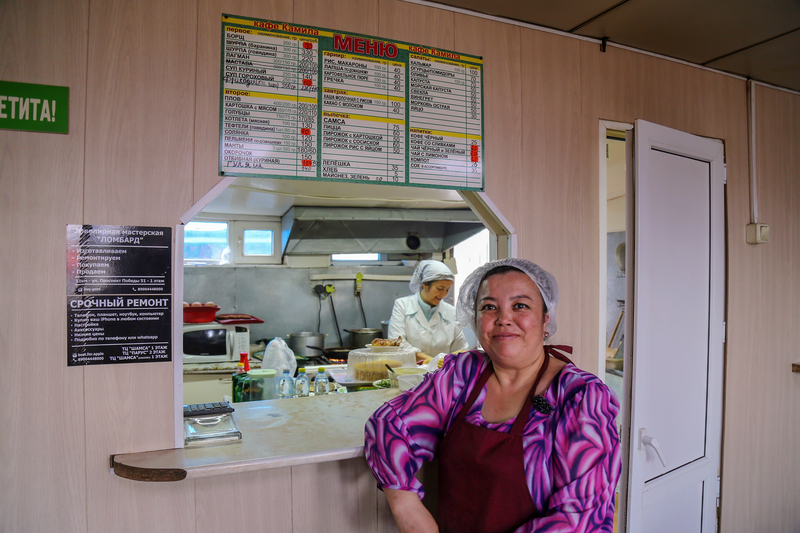 Gulnara, from Samarkand works in a small Uzbek cafe along the side of the road in Petropavlovsk Kamchatsky. Her husband works in the construction business and drives a taxi. They work in Kamchatka to send money to their children who are back in Uzbekistan. For some visitors, the Kamchatka Peninsula – an eight-hour flight from Moscow – doesn’t quite feel like Russia anymore. Kamchatka – a volcano-strewn promontory the size of Montana – is the definition of remote, even in a vast country like Russia. Government subsidies dried up after the Soviet Union collapsed, driving a sharp rise in prices for basic necessities. This was especially felt in places like Kamchatka, where many goods have to be shipped in from great distances. So people left. Since 1991, over 20 percent of Kamchatka’s population has emigrated, according to a recent briefing from the Carnegie Endowment. An estimated 10,000 have departed since the 2010 census alone. The population is now just above 300,000, with about six in 10 living in the regional capital, Petropavlovsk-Kamchatsky. Today Central Asian labor migrants help staunch the population decline and keep critical industries afloat. Feruz, a 26-year-old from Samarkand, moved to Petropavlovsk two years ago, hoping to save enough to get married. He had been deported from Moscow for visa violations. “There is a lot of work here and less pressure than in Moscow, with nicer people who are a lot more welcoming,” he told Eurasianet. Depending on the season, Feruz splits his time working in a restaurant, in a fish factory and on construction projects. He reckons hundreds or thousands of Central Asians do the same. The number of labor migrants working in Kamchatka is anyone’s guess. Many inhabit the gray economy. According to Kamchatka’s official statistical service, international arrivals during the first five months of this year more than doubled over 2017, to 2,251 people. About 40 percent are from Central Asia, mostly Kyrgyzstan and Uzbekistan. One lure is the wages. According to official data, they’re almost twice the average in other Russian cities. Local government data show that more than 80 percent of budget revenues are derived from the fishing industry. There are also naval bases in Kamchatka, including Russia’s largest submarine fleet; the military plays a pivotal economic role in this strategic region jutting into the Pacific. And although infusions of cash from Moscow are nothing like they were in Soviet times, Kamchatka remains heavily subsidized. It will receive the third-largest federal grant this year, more than 39.3 billion rubles ($587 million), less only than violence-prone Dagestan and vast Yakutia, according to business outlet RBC. In recent years, the Kremlin has marketed Kamchatka as a sightseeing destination. Tourists help stoke the demand for a larger labor force. There is currently a push to repair and build new roads on the peninsula. This development has boosted demand for labor migrants. Some come to Kamchatka for seasonal work; others stay all year. Dilibek Kuchkarov, a trained electrician from Andijan, arrived last year with his wife after both worked in Moscow for several years. He found a job through other local Uzbeks, and earns more than he was paid in Moscow, he explained over tea in Samarkand Cafe, a local Uzbek eatery. Kuchkarov takes home 60 to 100 thousand rubles per month, depending on the season. Minus the 20 to 25 thousand he spends on an apartment, he’s able to save enough to travel home every year. And unlike the hardships Central Asians often face in Moscow – police harassment, racism, bureaucratic hurdles – migrants seem to talk about Kamchatka with warmth. Farid, for example, arrived from Bishkek 10 years ago to stay with relatives. Now he works in the caviar business, shuttling salmon and their roe by the bucketload to Moscow. He hunts remote waterways far from the regional capital, noting that around Petropavlovsk the rivers have been depleted by overfishing. Winter on the peninsula is not as harsh as many expect. “People [back home in Kyrgyzstan] still don’t know what it is like to live and work here, and imagine Kamchatka far different than how it actually is. It’s not too cold for me, nor are the conditions too difficult here, despite lots of snow,” Farid said. Nicholas Muller is an American photojournalist and writer covering the post-Soviet space.